The San Diego County contingent at the 2018 CalFresh Forum. Our CalFresh Team, the County of San Diego Health and Human Services Agency, and members of our CalFresh Task Force descended on our state’s capitol to advocate for policies that support CalFresh (known as the Supplemental Nutrition Assistance Program – SNAP at the federal level and formerly known as food stamps) and engage with other CalFresh providers at this year’s California Food Policy Advocate’s (CFPA) CalFresh Forum and CalFresh Peer-to-Peer. Each year, the CalFresh Forum brings together hundreds of key stakeholders from across the state to identify opportunities and discuss strategies to improve the reach and impact of this vital food assistance program and hear directly from state and federal leaders regarding the current state of CalFresh and how to ensure the program continues to be available for those who need it. San Diego County was well represented at this year’s forum. Albert Garcia, CalFresh Program Manager for the County of San Diego Health and Human Services Agency presented on opportunities to connect Medi-Cal recipients to CalFresh benefits in our region. 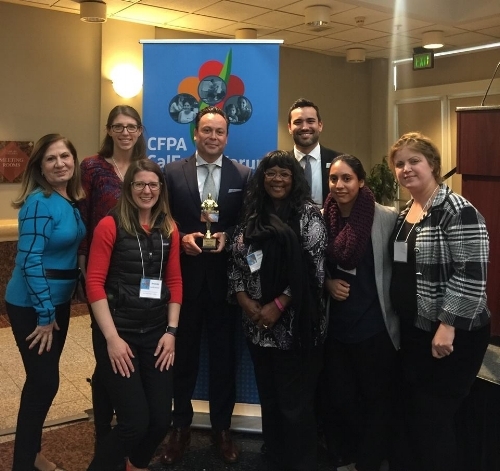 Ismael Lopez, CalFresh Community Liaison for the County of San Diego Health and Human Services won the forum’s “Freshy” award for CalFresh Outreach Leader of the Year Award! Members of our CalFresh Task Force also in attendance were Feeding San Diego, Heaven’s Windows, Neighborhood Healthcare, 2-1-1 San Diego, San Ysidro Health Center, San Diego Food Bank, La Maestra Community Health Centers, Catholic Charities Diocese of San Diego, and Alliance for African Assistance. Additional highlights from this year’s CalFresh Forum include dynamic presentations on how to protect and strengthen CalFresh given by Kim McCoy Wade, Chief, CalFresh Branch for the California Department of Social Services, Secretary Karen Ross of the California Department of Food and Agriculture, and Ed Bolen, Senior Policy Analyst for the Center on Budget and Policy Priorities. CalFresh application assistance agencies also met the day prior to share best practices and strategies for outreach with fellow case managers across the state as a part of the CalFresh Peer-to-Peer Forum, hosted by the California Association of Food Banks. At this statewide meeting, partners gained new perspectives on CalFresh college student outreach, Disaster CalFresh, and ways to talk to clients about potential changes to eligibility and time limits for childless adults (also known as Able-Bodied Adults Without Dependents or ABAWDs). The San Diego Hunger Coalition, Feeding San Diego and San Diego Food Bank served on the planning committee for this event. California Assemblymember Todd Gloria with San Diego Hunger Coalition Senior Director of CalFresh and Advocacy Amanda Schultz Brochu. While in Sacramento, our Senior Director of CalFresh and Advocacy Amanda Schultz Brochu took the opportunity to meet with Assemblymember Todd Gloria and staff members from six other California Assemblymember’s offices. She discussed food insecurity in San Diego County and AB 3033, a State Assembly bill authored by Assemblymember Brain Maienschein and co-sponsored by the San Diego Hunger Coalition and the Coalition of California Welfare Rights Organizations that would make it easier for people applying for Medi-Cal using Covered California to apply for CalFresh at the same time. Each year, the San Diego Hunger Coalition challenges people who don't have to worry about food to live off of the average CalFresh (also known as SNAP or food stamps) benefit per person in San Diego County. The 2017 #CalFreshChallenge took place May 8-12 and participants lived on a food budget of $4.18 for one day or $20.92 for five days. This year, many of the Hunger Coalition's anti-hunger partners that work to enroll eligible people in need in the CalFresh program took part in the Challenge. Cassandra Reese, a CIRS Enrollment Specialist at 2-1-1 San Diego shares her #CalFreshChallenge experience below. 2-1-1 San Diego serves as a nexus to bring the community (organizations) together to help people efficiently access appropriate services, and provide vital data and trend information for proactive community planning. I had planned to have backed potatoes with sour cream for dinner, but that won’t happen unless I can find a bag of potatoes for under $2 because that’s all I have left in the budget. The red beans will be lunch for the week. I was going to put it in tortilla for bean and cheese burritos. So I’ll either chose between the potatoes or tortillas with the remaining budget. I was soooooooooo hungry!!! I didn’t plan my meals or snacks well enough to prevent or get through the hunger. I was so hungry that I ate through over half of the snack (crackers) that I had bought to last the entire week. It made me wonder if families in need also run into this dilemma and use up most of their CalFresh benefits or the food they bought for the month in the first few days/weeks and then struggle to have enough food to sustain them through the rest of the month. After I shared with my coworkers my day one experience, including my grocery list and my remaining budget, a couple of them suggested that I go to the 99 Cent Only store. Since, I only had $2.10 left in my overall budget I decided to go to see what they had available. To my surprise the 99 Cent Only store not only had everything I had bought Day 1 at Walmart, but also for more than half the price. If I had only gone to this store first I would’ve been able to get DOUBLE the food and snacks to last me throughout the week. I would have also been able to get fruits, veggies, and more. So with my remaining $2 I bought tortillas and an extra snack to last me the rest of the week. Still hungry but not constant cravings like Day 2. Today’s challenge was temptations throughout the day. The first hour of work I was offered donuts and coffee. Then on my way to my break I was offered candy. At lunch, in the break room there were free sandwiches and the most beautiful looking spinach, cranberry, feta cheese salad with balsamic dressing. My resolved almost faltered after seeing the salad. Later, a coworker decided to sit a bag of chips on my desk when I went to the printer. When I came back I took the bag of chips back to their desk. After work, when I went to pick up my daughter my mom gave me a tray of pastries to take to my daughter's class the next day for teacher appreciation day. While preparing dinner I was presented with another moment of understanding. I started to make my dinner when I saw that I was running very low on all the food I’d bought. So I started to worry and ration the portions of how much I could eat and still have enough left for the last two days. The home stretch is here and still hungry but not as much. I MADE IT……HOORAY!!!! !.........BUT still hungry! I am happy and yet disheartened all at the same time. Happy because I was successful at completing the challenge and my awareness of hunger is more prevalent than it has ever been. But disheartened because I know families on CalFresh don’t have the ability or option to go back to spending whatever they chose on meals and their struggle to provide food for their families is ongoing. The poverty and working poor gap is widening everyday while benefits are diminishing. Under the current administration, the state of these much needed benefits are hanging in the balance. I wish the San Diego Hunger Coalition much success and support in your daily efforts to bring about hunger awareness and funding for your MISSION TO END HUNGER.